Thank you for your note. Well isn’t this a strange situation? I have to admit this has been a significant dilemma for me. On one hand I want to keep the ticket and sell it to recoup the £25 I paid you over the asking price for it. You obviously had no problem selling the ticket onto me for a profit. Ohh how the tables have turned (laughing evilly and stroking my cat). I want to give you a little background into my situation. I already had a ticket for the Foals, but I bought this ticket for a friend to come along with me. That friend can no longer come so the really ironic thing is that I now have two spare tickets and I didn’t need to buy the one from you in the first place! Now with the gig being on valentines day, two tickets are far easier to sell than one because most people will be out with their partners. But fear not young Tom, my moral compass is pointing in the right direction, so please find enclosed your ticket. You’ll also be pleased to hear that I found someone else to give my other spare ticket to. I do not expect anything in return for giving you this ticket back, as Winston Churchill once said “We make a living by what we get. We make a life by what we give.”. So Tom please let this be a lesson to you. As an aside I really hope you’re not actually some sort of tout. If you are indeed a tout my only remorse is that I can I take comfort in the fact that you are not a very good tout! And if you carry on like this your touting days are numbered sonny! Also Tom, why are you asking your mum to do your dirty work? You’re obviously old enough to go to the Foals on your own so I think it’s time you step up. 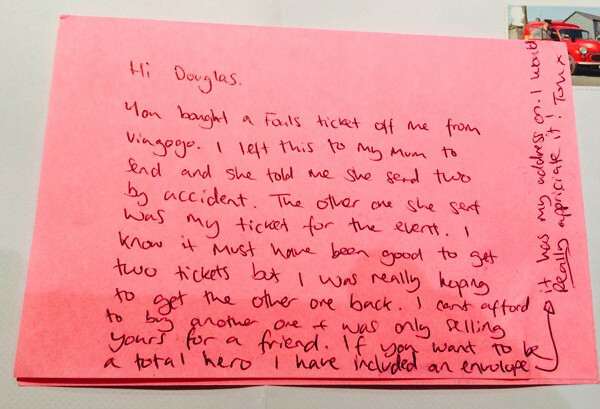 Your mother is obviously very kind and I hope you didn’t give her a hard time over these tickets, bless her. Finally Tom, just a little message about reselling gig tickets for a profit. Touts are killing live music! You should have been selling your ticket at face value through the website Scarletmist.com the ethical ticket exchange website. I hope that in the future you’ll be less greedy and use this website. Now you may say that I’m also part of the problem because I bought the ticket from Viagogo and that it takes two to tango and all that, but I really didn’t have a choice. I had checked scarletmist and they didn’t have any. My hands were tied. Now with my karma levels well and truly topped up I’m fully intending on having a cracking evening on Friday, I wish the same for you.